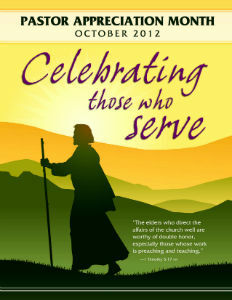 In the United States and other parts of the world, October is observed as Clergy Appreciation Month. One pastor said, “It is my favorite month of the year.” Some churches do everything they possibly can for their pastor. Their gratitude for a kind and loving shepherd is always being expressed. In what ways? In the prime of my life, when energy and enthusiasm seemed to be without limitations, I was the shepherd of a flock that gathered in a sheepfold in Decatur, Illinois, at a place called Peoples Church of God. The sheep I loved so much were led, cared for, looked after, guarded, protected, watched over, kept secure, and escorted to shady green pastures and still waters. They were the pride and joy of my life. I cannot relive those unforgettable years except through memory and pictures. There has not been a day since I left that flock that they have not been alive in my memory. I’m grateful to the thousands of people I met in that great church and wonderful city. Their appreciation expressed for Kitty and me, our children, Elizabeth and Mark, is an eternal blessing and benediction upon our lives. Neither the sheep nor their shepherd were perfect. We all did the best we could. If you could really have “do-overs” in life, I would like to be the pastor again of all those people and, of course, know what I know now. If I had known then, what I know now, it would have spared all of us a lot of problems, heartaches, and tears. The words of St. Paul, as the result of his afflictions, are an encouragement to every pastor: “But none of these things move me; nor do I count life dear to myself, so that I may finish my race with joy, and the ministry which I received from the Lord Jesus, to testify to the gospel of the grace of God” (Acts 20:24 NKJV). It was my determination “to shepherd the church of God which He [Christ] purchased with His own blood” (Acts 20:28 NKJV). I remember the night Jim Soules, chairman of the pulpit committee, called us at our house in Anderson, Indiana, and said, “It was unanimous—they all want you to come.” We arrived with our children, Elizabeth, four, and Mark, one, on August 1, 1964, and moved into a very modest house, which became the happiest place we have ever lived in, at 605 Frank Drive, and the place we lived for the longest time—twenty-five years. The church provided for most of our unpretentious pension and Social Security checks. Kitty and I know where most of it comes from. Paul Prince, Earl Waymire, and Joe Page could repair most anything that went wrong at the parsonage. When the snows got deep, they plowed our driveway. Lawrence Maxedon and those who had gardens assisted us and others with fresh vegetables. The youth of the church raked our leaves. We were invited into many homes for a meal. The congregation made it possible for us to attend the church’s conventions and visit areas of the world where we supported missionaries. Nona Cissna, the lady with the powerful and beautiful solo voice, kept a scrapbook each year for twenty-three years before she and Chuck moved to another state. She gave them to me. Another gift I treasure. These are just a few of the many ways this precious church expressed appreciation for their pastor every day of every month. And for all our pastoral associates. I encourage you who read this article to add to these suggestions in expressing your appreciation for your pastor. We moved from this beloved church and caring city twenty-three years ago, but our deep appreciation continues each day.